Vinegar drinks are all over right now. For years, centuries actually, people have been drinking apple cider vinegar for it’s health benefits. Drinking vinegar has been consumed for its health benefits since Ancient Greece. Then coconut vinegar came into the picture, and more recently chilled bottled vinegar drinks. I started drinking them on occasion last year when I fell in love with Pressery Drinking Vinegars that are made with coconut vinegar. Then Suja came out with their drinking vinegars and they seem to be everywhere. What’s in them ranges while some are made with juices, some probiotics, and even the consistency and type of vinegar varies. I also like to use these bottled drinks for salad dressings and cooking I actually picked up some new ones to try in some up coming recipes and used them in the dressing options in the Beet and Berry with Salmon Salad I posted a couple days ago. When it comes to vinegar in general I love them for cooking and have a dozen flavored balsamic vinegars. Again I am not a registered dietitian I just do research, try new things, and do what works for me. While some people drink shots of apple cider vinegar or vinegar water in the morning that isn’t for me. I did try it for awhile as it’s suppose to help with acid reflux. The only way I can drink it is with honey or pure maple syrup so drinking it every day isn’t something I do. When I do I also found I like to add a little juice to it so I came up with this Orange Vinegar Drink. It can be made with apple cider vinegar or coconut vinegar. 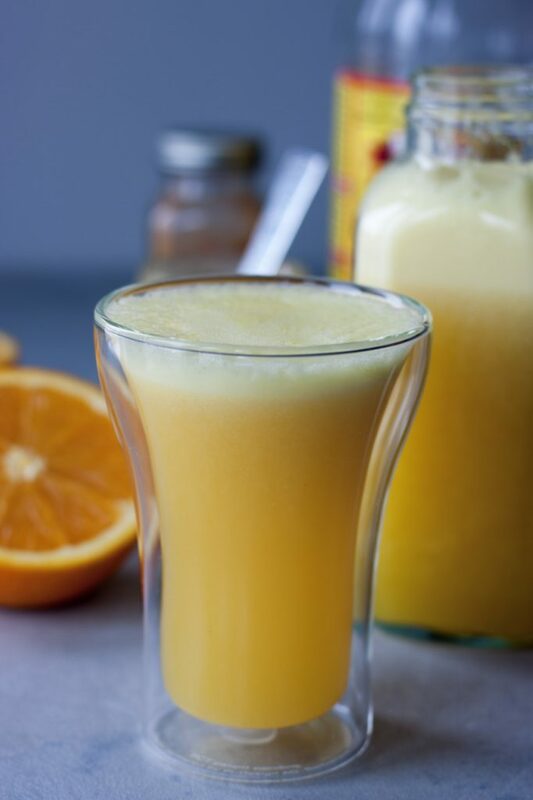 It’s made with a real orange for an added dose of vitamin C and it helps to cut the vinegar. I also do add pure maple syrup or local honey (great for allergies) and either a pinch of cayenne pepper or a little fresh ground ginger. While apple cider is well known for so many reasons, it supports immune health, helps with digestion and ph balance, helps with skin issues, relieves muscle pain (why Switchel was so popular back in the days of farming), and it helps remove toxins. That said I don’t believe claims of weight loss which is why many drink it and as far as removing toxins our bodies do that on their own but sometimes it just helps after a day of indulging. Now to coconut vinegar, which has also been called a super vinegar, contains amino acids, potassium and enzymes. Both are said to give you a boost of energy and contain antibacterial properties to help you ward off bugs and sore throats. I like both but I do prefer coconut vinegar as far as taste and what works for me. When I’m sick I often want coffee for the boost but it doesn’t agree with me and it’s the only time I don’t “crave” it or the smell. 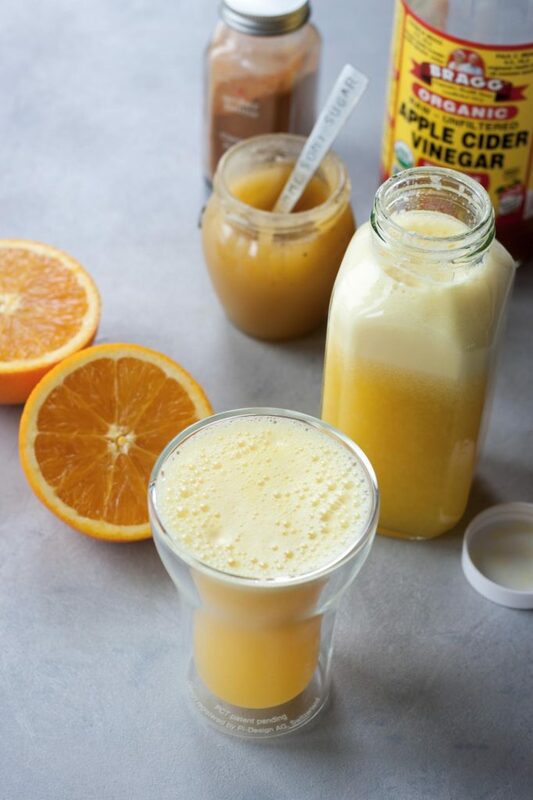 This Orange Vinegar Drink is a great way to start the day or drink throughout the day when I’ve got a cold coming on or am feeling under the weather. This year it’s been needed more then ever. 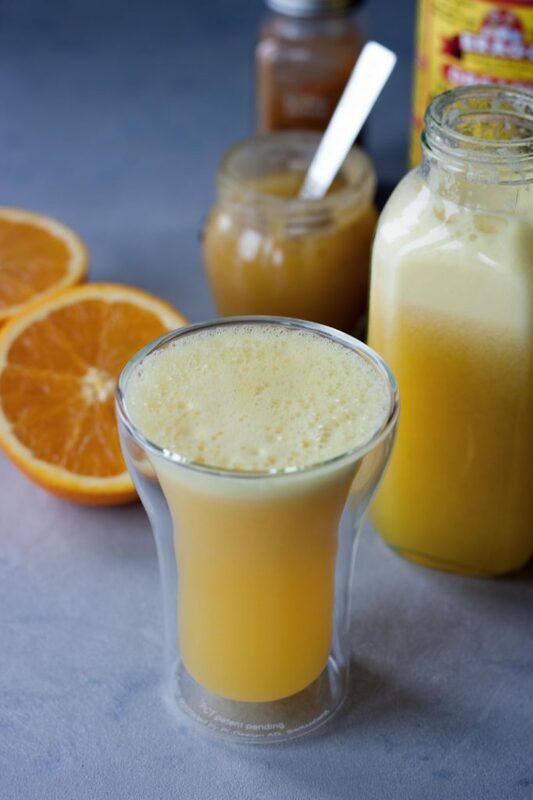 Between the fresh orange and nutrition and dose of vitamin C it packs, the vinegar, and honey/maple syrup it really helps, especially with a sore throat or cold. Have you tried vinegar drinks, thoughts, any favorites? In a Vitamix, or high-speed blender, blend everything together until smooth, I like to just use the smoothie setting. Adjust sweetness as needed. Enjoy! 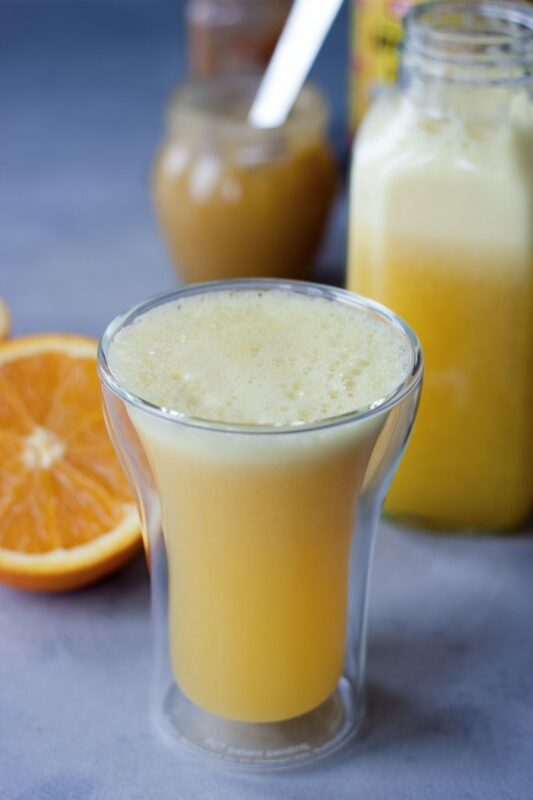 A sweet twist on a classic vinegar drink with a boost of vitamin C! Great start to the day or when you’re feeling under the weather. This is such a creative recipe! I bet this would definitely help you feel better! Oh! What an interesting use of ACV! I’ll have to try this out! I am a big Kombucha fan but making my own drinks would be nice. I will have to give this a try. Thanks for the inspiration!